Banana is a fruit many of us enjoy on a daily basis, whether it’s for breakfast, lunch, or just a snack. It has great versatility and such a complimentary flavor, that it’s used in a plethora of different cuisines and dishes, from curry to ice cream. This is the all-time favorite fruit that everyone in the family loves it. Anywhere you go, you can see the banana available at the grocery store, this is a fruit that is commonly available all over the world. This fruit is the powerhouse of nutrients, it is a heavyweight when it comes to nutrition. It is loaded with essential vitamins and minerals such as potassium, calcium, manganese, magnesium, iron, folate, niacin, riboflavin and vitamin B6. These all contribute to the proper functioning of the body and keeping healthy. The high content of potassium in bananas makes it a super fruit. This mineral is known for its numerous health benefits and it helps in regulating heartbeat, blood pressure and keeps the brain alert. 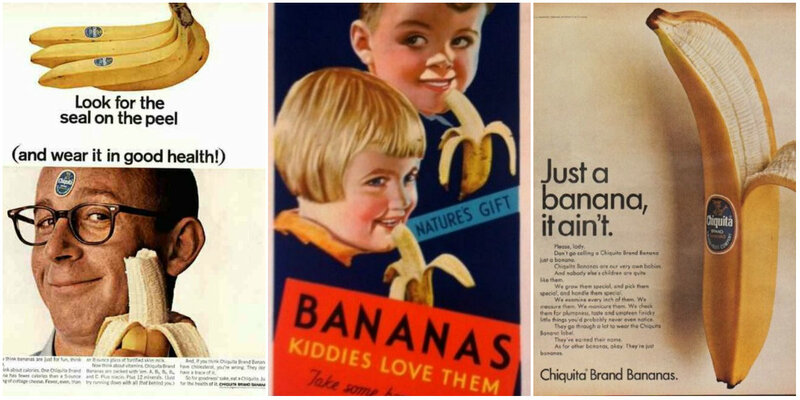 Here, below is a collection of 22 banana ads from the past that we love.